Choose a date — You need to choose your holiday party date sooner rather than later. Not only do your employees need to know, but it’s important to secure a date so your party planner and rental company like Pink Elephant can accommodate your request. Holiday party reservations can fill up quickly, so don’t procrastinate because you might not get the date you want or will have to compromise on the type of party you can hold. Food choices — The food for your party can be as simple as hors de oeuvres and appetizers to a full dinner. It really is your choice how you wish to feed your employees, but once again prior planning is needed. In addition, you need to make allowances for employees with food allergies or dietary restrictions. Also, have a clear understanding of how many people will attend so no one will be forced to eat while standing. Alcohol, and how much? — There are considerations when serving alcohol at your holiday party. First, alcohol can add greatly to the cost of the party, so you have to decide what the budget will allow. Second, you want your employees to be safe, so you may wish to limit alcohol during the party. Let your employees know you are concerned for their welfare if you choose to limit the alcohol service. Party planning can be stressful for company employees, but Pink Elephant Party and Tent Rentals can help remove a lot of the stress with our tent, food service, and seating rentals. 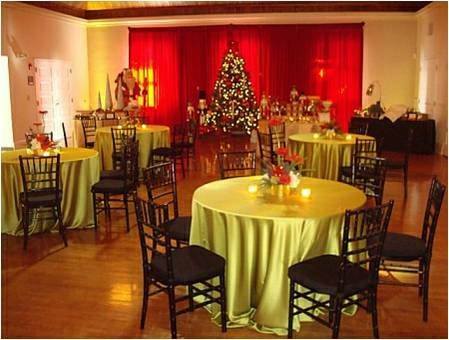 Contact us at 631-357-3561 in advance of your next holiday party, then enjoy the holidays with the rest of your employees.